Drew Hirshfeld is Commissioner for Patents for the U.S. Patent and Trademark Office. He was appointed to this position in July 2015. 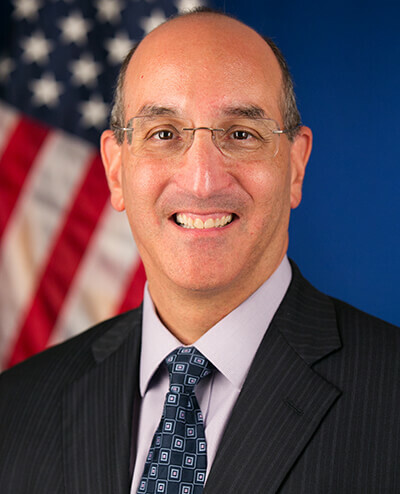 In his previous role as Deputy Commissioner for Patent Examination Policy, Mr. Hirshfeld served as an authority on patent laws, rules, and examining practice and procedure, and provided administrative oversight and direction for the activities of the Office of Petitions, Office of Patent Legal Administration, and the Office of the Manual of Patent Examining Procedure. Further, Mr. Hirshfeld established patent examination and documentation policy standards for the Commissioner for Patents. Prior to serving as Deputy Commissioner for Patent Examination Policy, Mr. Hirshfeld was the Chief of Staff to the Under Secretary of Commerce for Intellectual Property and Director of the USPTO. Mr. Hirshfeld began his career at the USPTO in 1994 as a Patent Examiner. He became a Supervisory Patent Examiner in 2001, and was promoted to the Senior Executive Service in 2008 as a Group Director in Technology Center 2100, Computer Architecture and Software. Mr. Hirshfeld received a Bachelor of Science from the University of Vermont, and a J.D. from Western New England College School of Law.